Best known for co-fronting beloved and long-running alt rock outfit MUTEMATH (who are currently hard at work on a new album), Nashville transplant Darren King, who only recently began performing solo shows under the moniker DK The Drummer, manages a feat few drummers have- he’s become perhaps the most visible member of his band, known for his unparalleled and bombastic playing style, participatory antics, and more involved musicianship than the vast number of artists who share his instrument. Over the years, King has branched out into production, working with artists as diverse as Say Anything and Kanye West, and, in addition to drumming, flexes his skills as a DJ and multi-instrumentalist. Tonight, March 28, Darren will bring his DK The Drummer show to The High Watt, where he’ll perform “live mashups of his favorite Electronic, Hip-Hop, and Instrumental tunes of the last 50 years,” handling drums and electronics. 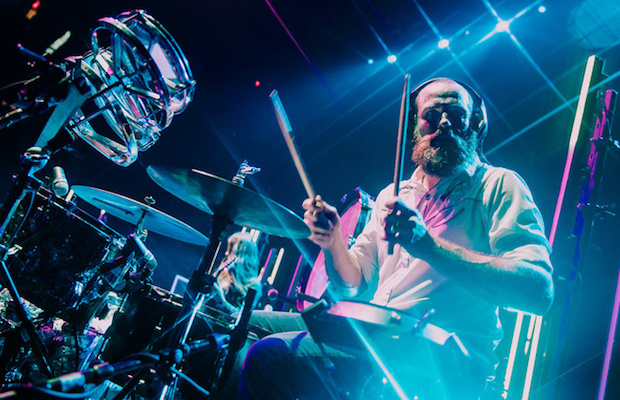 If you’ve ever been to a MUTEMATH show, odds are you could barely take your eyes off Darren’s intense and unbelievable drumming, so turning that into the whole show feels like the next logical step, and sure to be a treat for MUTEMATH fans and newcomers alike. Grab tickets for just $10 right here, and check out a clip of DK The Drummer’s first ever solo show from earlier this year in New York, which he performed while in town sitting in with Seth Meyers’ 8G Band. DK The Drummer will perform tonight, March 28 at The High Watt. The show is 18+, begins at 9 p.m. (doors at 8 p.m.), and tickets are available to purchase for $10. Elf Power Debut New Track “Halloween Out Walking,” “Watery Shreds” Video | Catch Them May 22 at The High Watt w/ Tobin Sprout!